Yogurt is a popular dairy product prepared from the fermentation of milk. Herdsmen of Bulgarian countryside were thought to have learnt the art of processing milk to yogurt Preparation and consumption of different types of yogurt is in prevelence unique to various culture and traditions world over. Yogurt use dates back to many centuris presribed for its prebiotic, and easy digesting properties. Although cow's milk is employed to a larger extent in processing yoghurt, it can also be prepared using buffalo, goat, sheep and soy milk to which starter culture added. Milk contains disaccharide carbohydrate, lactose. When culture containing fermentation bacteria (Lactobacillus delbrueckii subsp. bulgaricus and Streptococcus thermophilus) added, lactose converts to lactic acid. When enough lactic acid is produced, milk coagulates resulting in thick and custard-like textured food product. Fermented milk separates into two distinct parts; curd and whey. It is consumed as is after stirred or drained. 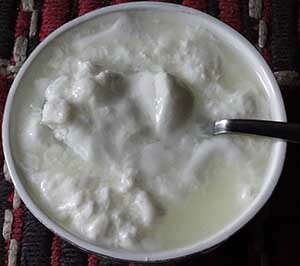 Ideally, fresh curd should be used as soon as possible, or else stored in the fridge. Plain yoghurt is made from whole, skimmed or non-fat milk. Natural yogurt contains no additional flavorings in it. The level of fat and milk solids in the milk will affect its texture, flavor and nutritional composition of the yogurt. Yoghurt is a low-calorie dairy product. 100 grams of plain, whole-milk yoghurt holds just 61 calories, almost the same as that of milk. Nonetheless, it is richer than milk since it contains additional probiotic compounds generating from the fermentation process. Fresh, plain yogurt carries more protein, vitamin-D, vtamin-C, folate, phosphorus and calcium vis-à-vis for the same quantity of milk it prepared with. Fresh yoghurt contains health-benefiting bacteria that facilitate easy digestion of lactose. Since most of the lactose turned onto lactic acid, yoghurt is more easily digested than milk. It has a better digestibility quotient even in people with lactose intolerance. Yoghurt is recommended as a prebiotic food since it contains compounds that favor growth of benefiting bacteria in the intestines. It contains several probiotic bacteria such as Lactobacillus delbrueckii subsp. bulgaricus, Streptococcus thermophilus, bifidobacterium bifidum which faciltate the growth of gut-friendly bacterial colony and suppress diarrhea causing agents. Tryptophan, an amino acid in dairy products, facilitates the production of serotonin and melatonin in the brain, and if taken before bedtime, encourages sleep. Regular consumption of yoghurt boosts immunity, and get the human body ready to fight against fungal infections and intestinal cancers. Yoghurt, whole milk, Nutritive value per 100 g.
Yoghurt making at home is easy and economical, and supply yoghurt that is rich in vitamins and minerals without any added sugar. To prepare, wash utensils thoroughly, and rinse well in hot water or sterilize before using. Heat milk to 85° F for about 30 minutes. Addition of 3% to 5% of milk powder thickens yoghurt, makes it creamy, and increases its nutritional value. Allow milk to cool to 43° to 46° C, and then add culture. Dehydrated yogurt starter, fresh commercial yoghurt containing live bacteria, or homemade yoghurt prepared within the last 5 days can be employed to prepare good yogurt. Avoid stirring yogurt while it is setting, or else it breaks up and become watery. Leave it to incubate constantly at 40° C for 4 to 6 hours. A thermometer may help to monitor the exact temperature and guide timing of ferment incorporation. The incubation temperature of yoghurt is crucial. The ideal temperature is set between 105° F to 115° F. Do not allow temperature to go beyond 115° F or else it will destroy the bacteria and prevent it from setting. Fermentation becomes slower if less than 40° C as lower temperature prolongs the setting time and makes the yoghurt sourer. Whole milk results in a firmer, tastier yogurt that is higher in fat and energy than it made from using skim milk. Gelatin or pectin can be added to the milk when it reaches the boiling point, if desired. In order to minimise risk of contamination, take care to set aside the amount needed for next culture. Yoghurt made with a dehydrated culture is creamier, thicker and less acidic than yoghurt made with commercial yoghurt; moreover, it keeps these qualities for a longer period and it can be used more than once to make fresh yoghurt. After about one month, or three batches, the yoghurt degenerate and a new ferment must be used. Fresh yoghurt can be readily available all round the year in the US stores. Check the use-by or sell-by date when buying. There is a wide range of the yogurt, including set yogurt and various products such as frozen yoghurt, drinking and dehydrated yoghurt. One may buy flavored, fruit added in these stores. Do not buy near expiry or beyond expired yogurt as you may it out of flavor and sour in taste. When the yoghurt set and achieved a desired texture and taste, refrigerate immediately to stop the further fermentation activity. Fruits or other ingredients are added just before eating. Avoid keeping it at room temperature as much as possible. Each time, use a separate, clean spoon to get fresh yogurt. If in deep freezer, preferably defrost it in the fridge (middle shelf) itself. Yoghurt is eaten as is, and also used in various cookings. It is added to soups, salads, meat, poultry, fish, race, pasta dishes, breads, cakes, desserts and drinks. Yoghurt employed as one of the basic ingredient in several hot or cold soups, as well as in the preparation of cold sauces for grilled skewers. It is used to marinate and tenderize poultry and game meat. It is an important ingredient in the middle eastern and Indian cuisines. it is used as an accompaniment to curries, and the basis of raitas (fruits or vegetables mixed with flavoured yoghurt). Plain yoghurt can be used as an healthy substitute to cream, and used whether liquid, whipped or sour. It can be added to mayonnaise or vinaigrette. If using it in place of cream in dishes requiring cooking, yoghurt needs to be stabilized by adding a little cornstarch. Bring it to room temperature for 1 to 2 hours before adding it to hot dishes and, if possible, at the very end of cooking. Drinking yoghurt is made from fermented milk, to which a fruit flavoured syrup or sugar, and fruit has been added, and is sometimes promoted as an healthy alternative to carbonated soft drinks. In India and Pakistan, a traditional mild sweet (or salty) drinking yogurt (lassi) is popular summer drink. It is prepared by blending dahi (yoghurt) with water, salt, and flavored with herbs like mint, ginger and fennel. <<-Back to Nutrition articles from Yogurt nutrition facts. NCBI-Survival of Yogurt Bacteria in the Human Gut US National Library of Medicine. (opens in new window). MDPI-The Inter relationships between Lactose Intolerance and the Modern Dairy Industry: Global Perspectives in Evolutional and Historical Backgrounds. pdf. (opens in new window). IFAS Extension-University of FloridaShopping for Health.. pdf. (opens in new window).